Great offers in-store at Homeland on the Dulux Colour Emulsion paint range. A selection of plants, fertilisers and lawn moss killers to help your garden bloom this Spring. Great offers across our Pet ranges available in Homeland Plus stores, includes treats & toys for dogs & puppies, rabbits & guinea pigs, fish and cats. Fill out an entry form in-store with every purchase of Dulux Weathershield Colours. Entry with every purchase of Nutrias Minerals & Nutri Start Milk Replacer. Don't cut corners on the dry period this year! 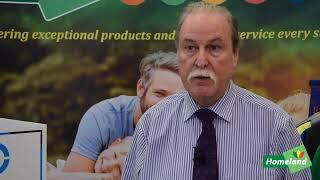 A short video on Aurivo's Nutrias Pet Food range for cats and dogs. Flexothane clothing has been specially engineered to withstand the toughest conditions. 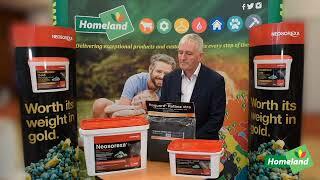 Watch to find out how Flexothane will protect & keep you warm when outdoors and on the farm. A short video outlining how to safely install a PTO shaft. 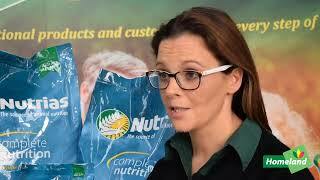 A short video on Aurivo's Nutrias working dog food range. A short video outlining all lighting required for agricultural vehicles. A short video showing you how to use the buddex gas dehorner. A short video showing you how to use a calving jack. A short video on Aurivo's Nutrias mineral range which caters for all large animals including, dairy, beef, sheep and equine. A short video showing how to clean your drenching gun and syringe after use. A short video on using Deosan Liquid CIP and Divosan OSAN for washing milking parlours. A short video on the best practice for using Deosan Teatfoam Advance. A short video on using Deosan Farm Cold Cleaner and Divosan OSAN for washing milking parlours. Neosorexa Rodent Control Programme with four simple steps to implement a rodent control programme on your farm.